The completion of the initial part of the deal spotlighted its wider significance. Earlier this month, Japan and the Philippines finally completed the completion of a new agreement that saw Manila acquire helicopter spare parts from Tokyo. 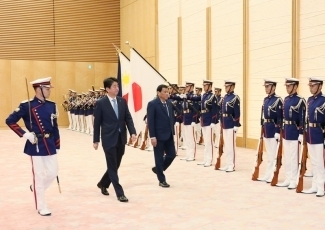 Though the deal is just one of many developments their relationship, it is not without significance for the defense relationship, for Tokyo’s role in Southeast Asia, and for the region more generally. As I have noted in these pages, while Japan and the Philippines have long had a bilateral relationship, the development of the defense aspect of ties has been accelerating over the past few years, covering various issues including not just defense equipment and transfer, but also critical capacity-building and broader regional cooperation in areas ranging from cybersecurity to maritime security. Some of that has continued in spite of the challenges posed by the rise of Philippine President Rodrigo Duterte. Among the deals, which first surfaced back in 2017, was one where Japan would provide spare parts for the Philippines’ UH-1H combat utility (or “Huey”) helicopters, helping Manila with its ongoing challenge of managing its existing helicopter fleet. And earlier this month, we finally saw the first portion of the deal completed, with the turnover of spare parts occurring alongside a formal signing ceremony at a Japanese defense facility on March 12. Per Philippine officials, this particular spare parts donation seen in that ceremony, worth about 5.3 billion yen ($46 million), consisted of items such as airframe structures, dynamic power, control, rotor, hydraulic, electrical, and instrument systems, which were transported via a C-130 plane. Philippine officials have indicated that remaining items will be transported via Philippine Navy ship sometime this August. While the development is just part of an ongoing effort within the wider relationship, it is not without significance. For one, as a practical matter, with these spare parts now available, the Philippines can now restore and move several helicopters back to operational status again, both ensuring their full serviceability and readiness and also extending their already long service life. The helicopter fleet is currently being used for various functions, including internal operations related to humanitarian assistance and disaster relief and counterterrorism. More strategically, this is a practical illustration of how Japan’s efforts at loosening previous restrictions on providing defense equipment to foreign countries can actually tangibly contribute to the advancement of regional security. As Philippine Defense Secretary Delfin Lorenzana noted, the Philippines has effectively become the first Southeast Asian country to receive such a spare parts deal from Japan. That should serve as a reminder about the broader effect of this single development and others like it in Japan-Philippines defense ties. Where is the New Japan-Philippines Military Helicopter Deal? A potentially significant agreement on spare parts appears to be moving forward.